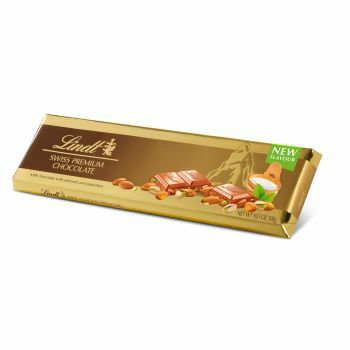 The limited Lindt Gold Bar 300g Milk Almond Pistachio combines finest Swiss milk chocolate with whole aromatically roasted almonds as well as whole subtly salted and well roasted pistachios. It offers an impressive, exquisite and highest quality chocolate experience. Presented in a golden premium packaging, it is the perfect gift for any occasion, as well as an extra-special treat to buy for oneself.